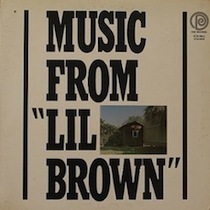 Known to J Dilla disciples for his sampling of “Light My Fire” on Donuts, it was Lil Brown’s title and artwork – an obvious nod to Music From Big Pink – that initially caught my ear a few years back. I suppose all roads do lead to Rome. Aside from the title nod, “Lil Brown” is a far cry from Danko/Manuel. In lieu of the fabled West Saugerties, NY rental in which the Band hashed out their opus, here we’re presented with a modest brown garage tucked away in the Baldwin Hills neighborhood of south Los Angeles. It was in this garage the members of Africa both conceived and laid down what would constitute their sole (commercially released) album recorded under the collective handle of ‘Africa’. Comprised of seasoned L.A. vocal group veterans, doo-wop and otherwise, Africa’s m.o. wavered between interpretations of, then, contemporary rock covers to soul and funk originals. Incorporating and exploring a wide swath of styles and arrangements (from Latin rhythms and funky hoodoo to traditional R&B and soul flourishes) the album at times feels geographically unplaceable — which is exactly part of it’s enduring charm. Produced by Lou Adler, 1968. AD strikes again! This is another home run…. How have I gone 29 years without hearing this? Such a great lp which I’d totally forgotten about – thanks for reminding me! just read up on their history – damn this is a find. RE: sole (commercially released) album. What else is there? @david – the group (i.e. the players themselves, not under the name ‘Africa’) apparently have another record out there…Ive yet to hear it. Where can I find this album to buy or download? I can’t find it anywhere on the net. All I’ve found so far is a couple of articles describing how amazing the album is, which has made me want to hear it even more!! out of print – shows up on ebay tho from time to time. I’ve managed to find single track down load links for Paint It Black, Light My Fire and Here I Stand, but I’m struggling to find the other tracks. Damn! Light My Fire is awesome!!!!!!! @phil – hold on to it. rare. Just found it today for $.33 at a thrift store in Layton, Utah. Couldn’t believe my eyes!